Many women from their mid-30s to late-fifties develop fibroids - benign non-cancerous growths in the wall or lining of their uterus. Although they are commonly without symptoms, for many women it can blight their lives, causing problems due to pressure on the bladder, heavy bleeding and abdominal pain. The bleeding, along with clots, can be so heavy that it’s euphemistically called ‘flooding’, even to the extent that some women become seriously anaemic or are changing pads at such a rate they can barely get to the toilet in time. Medical treatment can help, usually involving hormones, the Mirena coil or by removing the lining of the womb. However, for those with persisting symptoms there is some good news - a relatively new treatment is available to get rid of problematic fibroids – one that doesn’t involve surgery. Uterine Artery Embolisation (UAE), appears to be just as effective, but with far fewer side effects. It has a faster recovery time and is cost effective too. Yet according to interventional radiologist, Dr Jocelyn Brookes, who introduced the procedure in University College London Hospital over 15 years ago, this is not being routinely offered by gynaecologists, who are still far more likely to cut out the fibroids or remove the uterus. It seems that women don’t need their wombs once they have had a family - just whip it out once and for all. Job done. But surgery risks significant complications such as bleeding, infection, breakdown of wounds, and bladder, ureter or bowel injury, as well as the development of scar tissue internally. Often overlooked is the potential impact in some women of reduced sensation and sexual function, as well as the likelihood of earlier menopause. Surgery also involves an anaesthetic, several days in hospital and a period of recuperation. UAE is becoming an increasingly popular non-invasive way of getting rid of fibroids. Dr Brookes explains that it is done by embolization. This means injecting fluid containing tiny particles through a narrow tube inserted via an artery in the groin and into the arteries for the uterus. The particles then silt up the small blood vessels in the fibroids. By blocking their blood supply, the fibroids are destroyed, whilst preserving the rest of the uterus. It was discovered entirely by chance, having been developed originally as a lifesaving treatment for post-partum haemorrhage after child birth to stop heavy bleeding from the uterus. They found, coincidentally, that in women with fibroids, their fibroids had disappeared. Yet hysterectomy remains one of the most common surgical procedures carried out on women, with an estimated 55,000 done in the UK per year. And, despite UAE being available for over 20 years, only around 200,000 are thought to have been performed worldwide. 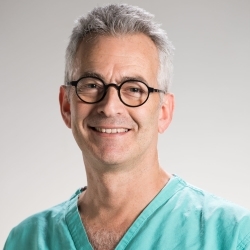 Dr Brookes is astonished that gynaecologists are not offering this safe and effective procedure to more patients, as it is just as effective, faster and with fewer side effects than having surgery. It can also be done using equipment available in most large hospitals. Most patients experience a significant reduction in symptoms and a return to normal quality of life within the 6 months. Perhaps it’s time more patients started asking about it as an option. If you would like some more information, please visit The London Clinic's website, read this journal, or contact Jocelyn at jocelyn.brookes@nhs.net.